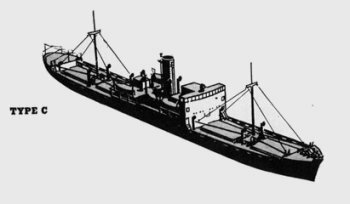 Dimensions 321'5" by 44'1" by 20'10"
The 1Cs were standardized cargo vessels. The design was standardized by the Ministry of Communications, with assistance from the Navy Ministry, early in 1942, and was based on uniform specifications adopted by several yards prior to the war. They were not significantly different from peacetime designs, with machinery admidships, and were intended for economical use after the war. The ships used coal-fired reciprocating engines and had four deck hatches and double bottoms. Accomodations and bridge were in a single deckhouse amidships.